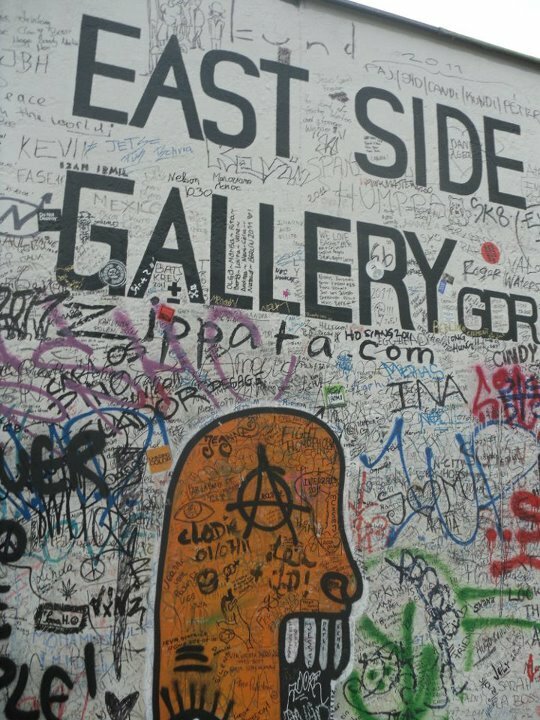 Many thanks to Lizzie Davey for this post on the Berlin Wall East Side Gallery. Read Lizzie’s blog for more posts about travel and culture: Wanderful World. At 1.3 kilometres long and featuring 106 paintings by international artists, the East Side Gallery is the largest open air gallery in the world. It stands as a memorial for freedom at a time when the future of Germany was unstable. The use of art here has become an expression of the turbulent times a separated and then unified Germany faced; the old and the new Berlin. In 1989, when the wall came down, hundreds of international artists collected at the east side which was once untouchable, and turned it into a colourful, exquisite memorial, providing a new future and place for the wall in Berlin. The paintings exhibited here express a new beginning and put forward new, euphoric hopes for the city; hopes that were formed when the wall came down. When visiting the East Side Gallery last year, I was amazed by the diversity of imagery on display. However, all seemed to convey a similar theme; freedom. The array of colour displayed in such a large format can be overwhelming, but once I reached the end I wanted more. Remembering that the gallery is actually exhibited on the wall, the wall that was once a huge part of German history is amazing and will enforce the struggle Germany faced during this time for years to come. Some critics state that the wall is in such bad condition now that the original artworks are almost undecipherable. I, however, think that it has evolved with the times, creating a portal where citizens of Berlin can express their feelings via an artistic platform. In some ways, the graffiti overlaying the original paintings only enhances the wall, showing how the visions and outlooks of the people have changed over time. Each piece was unique and brilliant in its own way, including the newly added graffiti that has accumulated. The memorial was created to express freedom, and surely this is evident in the way the wall appears today as an almost interactive gallery. Again, thanks to Lizzie for this post. Don’t forget to check out her blog: Wanderful World. I have a piece of the Berlin wall on my mantelpiece – which is probably why it is in such a bad condition at he moment!